We hear it all the time: "EMRs don't measure up to paper," "It's hard to use," "My EMR doesn't allow for patient interaction." It seems rarely is a good word uttered about EMR use. 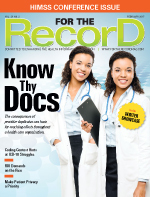 According to Kalorama Information's "EMR 2016: The Market for Electronic Medical Records," approximately one-third of hospital administrators are dissatisfied with their EMR purchase, with some exploring the option of replacing their current vendor. In a Black Book Rankings survey, one in six medical practices said they plan to change vendors. Here's an all-too-typical complaint heard throughout the industry: "We had our paper charts shredded and were told to use the computer. The training and support were there from administration and management, but the patient engagement strategy and overall care experience simply couldn't pivot overnight. Some of the kinks are yet to be worked out, which will occur over time, but the satisfaction of our patients in the electronic world is at the cost of our staff. Certain users are happy with the new electronic system, but not the ones who have to end up working the hardest to make it go." What can be done to boost EMR satisfaction? What would the ideal EMR application look like? To find out, it's best to go straight to the source of the complaints. Garry Choy, MD, assistant chief medical information officer of the Massachusetts General Physicians Organization, told Becker's Hospital Review of a need for "good-looking EMR" systems that provide easier, more user-friendly, and aesthetically pleasing interfaces: "We not only want to input notes, read notes, and check lab values, but rather we want to talk to our colleagues as clinicians. … We need to integrate communication into the EMR." As for data access, Choy said, "If we can Google for any information on the web, we should be able to Google our medical records." A Frost & Sullivan report, "EHR Usability — CIOs Weigh in On What's Needed to Improve Information Retrieval," concludes that it is nearly impossible for physicians to get the right information at the right time from their EMRs. The report stresses that patient data are required at the point of care; otherwise, it's frustrating and puts patients at risk. "EMR systems don't allow patients to control who can see, use, or disclose sensitive health data," Deborah Peel, MD, a practicing physician and national expert on medical privacy, told Healthcare IT News. "Today's EMRs were never built to comply with [patients'] constitutional and ethical rights to privacy. This is very different from how paper medical record systems work where doctors always asked for [patients'] consent before releasing [their] records to anyone." In that same article, Natalie Hodge, MD, FAAP, author of the blog Healthergy.net and cofounder and chief medical officer of Personal Medicine Plus, said, "[We should] generate applications that are user friendly. When you talk about portals, it's referring to patients; you need a system that works like a consumer internet application so people can reset passwords on their own, for example." She added, "From a physician's point of view, patients who log in and upload insurance cards or their old records, for instance, are invaluable. That enables patients to do more, and the more they're doing, the less I'm doing, and the less people I have to hire." Naturally, how an EMR is constructed affects providers, payers, and patients differently. Providers are EMR consumers who use the technology to distribute care. They need discrete data, such as "radio buttons," with all their pertinent data separated and highly organized. Discrete data should be searchable, transferrable, quantifiable, and operationalized. Providers will always focus on the human aspect of health care. Payers deal in payment and the risks associated with patients. Driven by monetary stability, their main priority is to be as fiscally efficient as possible. They rely on discrete information about what's happening in the industry and must have access to large swaths of population health data. While they are predominantly data consumers, they need to partner with provider organizations both small and large to optimize their value. It's cheaper to take care of healthy people than it is to tend to the sick. Patients need easy access to their medical records and the ability to share this information with their providers. Remarkably, this is an issue that is usually forgotten—until the day arrives when the information is needed. In other words, patients don't need these data until they need them, and then they really need them. When an adverse health event occurs, it's important that critical information be easily accessible and capable of being moved to various providers. A recent Surescripts survey found that 94% of patients want their health data to be stored electronically in a single location because doing so would not only save physicians time but also make it less likely they would be prescribed the wrong medication. Many patients and physicians express concern about the effects of a computer being present in the exam room. Is it a distraction? Does it pose a barrier between provider and patient? Is there a way to blend technology into the background? The use of certain EMR tools such as integrated health calculators is enhancing patient/provider interaction, creating an additional platform for patient engagement. Technology should facilitate care, not impede the process. • Accessible. The value added and potential to resurrect massive technical debt due to layers of single sign-on (SSO) technology and domain management over the years is almost certainly not an option in the most optimal of architectures. Incorporating and bridging these foundations out to features, such as biometric authentication and directory relationships, is necessary. • Efficient. Developers should continue to design and implement features such as automated questionnaire scoring and health calculator algorithms. These are complex calculations only a computer can perform quickly while at the same time yielding a return on investment by capitalizing on existing medical record data and reducing the potential for error. • Modernized. This isn't as much about aesthetics as it is about keeping up with progressive technology over multiple generations. Yes, there is a certain look and feel to the "systems" we encounter in everyday life such as phones, ATMs, and vehicles. Not only does this create an all-around more pleasant user experience but it also is inherently more intuitive to users and requires less training to implement and onboard. • Reportable. The appeal of new and improving architectures is driven on one hand by fragmented and useless data sources and on the other by the need to consolidate and access clinical and financial data. The optimal application needed by big players must link proactive patient care with bundled reimbursement models. Providers cannot implement a new solution without accounting for historical data that patients and payers will eventually need to access. The current data storage model is arguably a "folder." Different pieces of information, or files, are stored in different areas of the application. It's an antiquated model that mostly relies on users recalling where they stored data, a significant barrier to finding the right information for the right patient at the right time. In a patient-centric model, a complete and discrete health record should live in a universally accessible place with a unique identifier. This would allow providers to complete tasks such as transitioning to a data archive in one click (including SSO integration and patient context). The longitudinal or multidimensional nature of how data are stored should not prevent analytical discovery or retard advancement toward a thorough and accurate diagnosis. Tools such as natural language processing must begin to significantly factor into a provider's vision of the future. Dictating a note should be similar to having a conversation with the patient but with the addition of intelligent parsing, keyword indexing, and more robust automation supporting care plans and artificial intelligence. The ideal EMR solution should appeal to providers, payers, and patients alike. It will have a user-friendly interface into which providers can easily add information and from which they can just as easily find information. Providers will spend more time interacting with patients and less with the system. The ideal system will have heightened security measures that better comply with patients' privacy rights; their consent will be mandatory within the system before information can be transferred in any way. In that sense, the perfect EMR, regardless of vendor, will share data in such a manner that records are accessible to patients, providers, or payers. Is this vision possible? Let's hope so. But until an EMR vendor steps up and changes the game, the industry must archive old solutions, optimize current solutions, and migrate to new solutions. — Julie Champagne is a strategist at Galen Healthcare Solutions, which provides IT consulting services to specialty practices, hospitals, health information exchanges, health systems, and integrated delivery networks.